Disappointed by the docs with the big names attached, I decided to unearth the smallest one I could, and with Jeanie Finlay’s ‘Sound it Out’ I stumbled upon one of the most vital and innervating films of the entire festival. 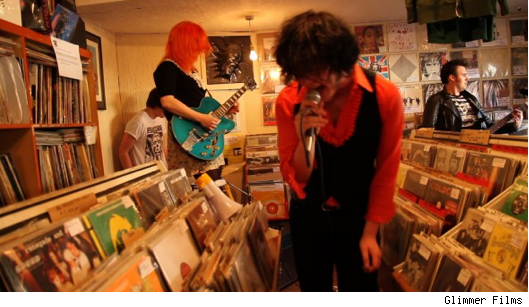 Finlay’s doc is a loving sketch of the last remaining record store in Teesside, North England, and Finlay divides her kind attention equally between Tom (the shop’s gruff but affectionate owner), his most eccentric customers, and the decaying area in which Sound it Out Records has become such a precious anomaly. ‘Sound it Out’ is a huggable little look that blossoms from the outside in, beginning with some gorgeous looks at the Teesside area and Tom concluding that “Men like to collect.” We watch as an eclectic group of such men come in and out of the store, perusing their way down the cramped aisles and leafing through their hidden treasures on a quest for that one record that will complete them (albeit temporarily). We meet a lonely bloke named Shane who’s afflicted with Cerebral Palsy and an unabashed mania for the boogie rock band Status Quo, and two teenage boys who are mad for hair-metal, and sew patches of the bands they’ve seen on denim jackets they never wash. There’s a local trio of DJ’s who spin the worst music imaginable from a shack outside of a house that belongs to one of their mothers, and an older gentleman who wanders in from the pub across the street with a hankering for Meat Loaf that’s matched only by his hankering for the ladies. All of these folks contribute to a little community that feels like a cross between ‘High Fidelity’ and a Richard Curtis movie, but with a fair bit more on its mind than throwing a few wacky characters at one another and watching what shenanigans may come. Finlay may have made a more significant film had she probed deeper or been willing to disrupt the relentlessly fuzzy vibe to which she commits, but even for all of its pleasantness ‘Sound it Out’ quickly looks beyond its initial “Boys and their toys” mentality. Rather, Finlay’s doc — the kind of film that’ll make you want to rush home and start recording all the stuff you love — evolves into a tight mosaic that’s something of a revisionist Peter Pan story for music geeks, an endearing look at a troupe of boys who don’t want to grow up, and never should. Vinyl might not be the driving commercial force of the record biz anymore, but ‘Sound it Out’ is a fun and touching reminder that the positive things which bring us together will never go out of style.